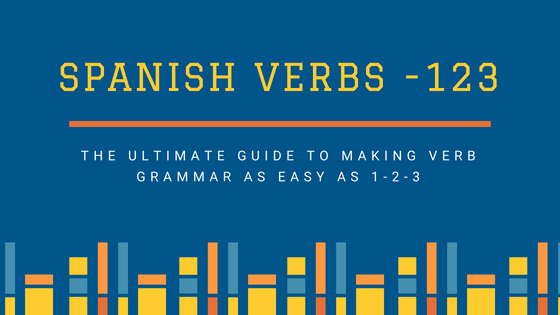 This is a basic overview of the concepts you need to get started with Spanish verbs. Infinitive - This is the basic, unchanged form of the verb, e.g. to swim (nadar), to have (tener). Subject pronoun - This is the subject of the verb in action, e.g. you swim, he swims, she swims. Conjugation - This is the form of the verb that changes depending on the subject and tense, e.g. I swim, he swims, you swam. ustedes (or Uds.) / you (all) - when talking to a group, formal in Spain, used for both formal and informal situations everywhere else. Vosotros is used when speaking to a group of people you are familar with, but is only used in Spain. In Latin American Spanish ustedes is used when speaking to groups of people formally and informally. When conjugating verbs, él, ella and usted all share the same form, as do ellos, ellas and ustedes. All verbs belong to one of three groups, depending on the ending of the infinitive, -ar, -er, and -ir. Each group has a set of endings that are added to the verb, depending on the subject and tense. For example, in the present nosotros (we) form you replace the ending with -amos, -emos, and -imos respectively. Some conjugations are irregular and do not follow these set rules, these must be learned individually. When conjugating verbs the personal pronouns are not normally used because the verb ending tells you the subject of the verb. It is only necessary to include the personal pronoun for clarity if the subject isn't obvious from the context, or for emphasis. To make a phrase negative you simply add no in front of the verb. You can also use other negative words instead of no. Asking questions is very easy in Spanish. The simplest way is with a rising intonation, without changing any words. Notice that in Spanish questions include an upside down question mark at the beginning of the question.